The Frankfurt Motor Show was the site chosen by Jaguar to unveil its all new R Coupe concept. Not intended for production, the luxury four seater is intended to demonstrate how the company's design philosophy may develop over the next few years. Jaguar’s managing director Jonathan Browning said “This represents a long-term vision though, rather than anything that we will see tomorrow. The R-Coupe provides an insight into Jaguar's long term future design philosophy, reaffirming our commitment to create cars that stir people's emotions.”While the R Coupe is not based on any Jaguar platform, it would be based on a V8 drivetrain and feature such innovations as F1 styles paddle shifters, electronic door releases, Xenon headlights which follow steering, LED lights, . 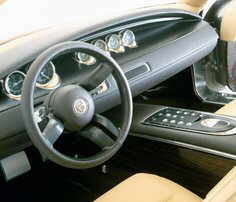 The interior is a blend of traditional Jaguar leather and veneers combined with modern touches using various textures and metals.While no mechanical specifications have been defined, visible components include massive 21 Alloy wheels with ultra low profile Continental tires featuring Jaguar Claw thread pattern. The R Coupe concept comes straight out of Jaguar's new advanced design studio headed by Julian Thompson, a team set up by by Jaguar's Design Director Ian Callum soon after his appointment in 1999. “With the R-Coupe we have the ability both to explore and to display our future design philosophy for Jaguar,” says Ian Callum, Jaguar’s design director. “Concept cars like this provide an incomparable opportunity for us to try out new ideas and to experience them in a full-size, three-dimensional format. We’re looking forward to learning a great deal from the reactions of the public too.”While the R Coupe will not be put into production, Jaguar has two important projects much closer on the calendar and to Jaguar showrooms: the new XJ saloon due for launch in 2003 and the F-type sports roadster for 2004.